Sigismund III Vasa (Polish: Zygmunt III Waza) (June 20, 1566 – April 30, 1632) was Grand Duke of Lithuania and King of Polish, a monarch of the united Polish-Lithuanian Commonwealth from 1587 to 1632, and King of Sweden (where he was known simply as Sigismund) from 1592 until he was deposed in 1599. He was the son of King John III of Sweden and his first wife, Catherine Jagellonica of Poland. He was the last ruler of the Polish-Lithuanian Commonwealth belonging to the House of Gediminas and to its branch, the Jagiellons, although from a female line. Sigismund owed allegiance to the Imperial Habsburgs as a member of the Order of the Golden Fleece. 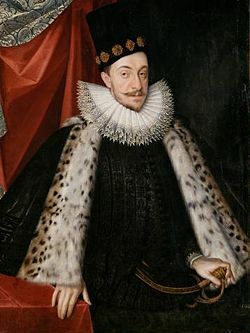 Elected to the throne of the Polish-Lithuanian Commonwealth, Sigismund sought to create a personal union between the Commonwealth and Sweden (Polish-Swedish union), and succeeded for a time in 1592. After he had been deposed in 1595 from the Swedish throne by his uncle, Charles IX of Sweden and a meeting of the Riksens ständer (Swedish Riksdag), he spent much of the rest of his life attempting to reclaim it. Hence, his reign initiated a series of dynastic wars (the Polish-Swedish wars) lasting seven decades between the Commonwealth and Sweden that continued sporadically from 1595 until the 1660s. Due to his failure to achieve anything of lasting importance apart from setting the stage for future devastating wars, some historians, such as Paweł Jasienica, regard his reign as marking the beginning of the end of the Polish Golden Age. He was commemorated in Warsaw with Zygmunt's Column, commissioned by his son and successor, Władysław IV. His personal and territorial ambitions which led to countless wars were of no benefit to his Polish subjects, whose welfare he neglected. There are no morality lessons on good governance to be highlighted in the biography of this king. English translation: Sigismund III, by the grace of God, king of Poland, grand duke of Lithuania, Ruthenia, Prussia, Masovia, Samogitia, Livonia, and also hereditary king of the Swedes, Goths and Wends. Sigismund Waza-Jagellon (1566-1632) was elected King of Poland and reigned 1587-1632. By paternal inheritance, he succeeded 1592 as King of Sweden and was regarded as having abdicated 1599 and finally deposed 1604. From his grandmother Bona Sforza he inherited the title of King of Jerusalem. Coat of arms of the Polish branch of the House of Vasa as elected kings of Poland (Lithuania and Ruthenia) and rightful hereditary kings of Sweden (Finland and Estonia). Royal banner of Polish-Lithuanian Commonwealth during the reign of the House of Vasa (1587-1668). King Sigismund III in Spanish costume. Sigismund III as a child. Painting by Johan Baptista van Uther. He was born at Gripsholm during his parents' imprisonment by King Eric XIV. Although Sweden was Protestant, Sigismund was raised a Catholic. This fact, combined with the troublesome personal union, would later strike back at his attempts to find support in Sweden. His mother, Katarzyna Jagiellonka, was the daughter of Sigismund I the Old and his wife Bona Sforza. The Jagiellon dynasty had held the crown of the Polish-Lithuanian Commonwealth since the first Jagiellon ruler, Władysław II Jagiełło, had received it in 1386 through his wife Jadwiga Angevin. In 1587, he was a candidate for the monarch of Polish-Lithuanian Commonwealth, following the death of previous Polish king, Stefan Batory. The election was held in the shadow of conflict between the Polish nobility (szlachta), with the two opposing sides gathered around Chancellor Jan Zamoyski and the Zborowski family. Sigismund, supported by Zamoyski and the former king's wife, Anna Jagiellon, was elected King of the Polish-Lithuanian Commnwealth on August 19, 1587, and recognized as such by the interrex, the Primate of Poland, Stanisław Karnkowski. However, the election was disputed by the other candidate, Maximilian III of Austria, and opponents of Sigismund chose not to respect the election outcome, decreeing that Maximilian was the rightful monarch. Neither Sigismund nor Maximilian were present in the Commonwealth at that time. 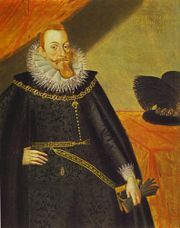 After receiving news of his election, Sigismund quickly departed from Sweden and arrived in Oliwa on October 7 (his landing was delayed due to the hostility from the Protestant Gdańsk). In his Pacta conventa Sigismund accepted a reduction of monarchal power in favor of the Sejm (Commonwealth parliament), which in all probability marked the beginning of the decline of the Commonwealth and the end of Poland as a great power of the era. Lesser Prussian Treasurer Jan Dulski representing the Crown Marshall Andrzej Opaliński proclaimed him to be the king. Sigismund returned to his ship on the same day, arriving in Gdańsk next day, and after approximately two weeks he had departed to Kraków, where he was crowned on December 27 of that year. When Maximilian attempted to resolve the dispute by bringing a military force and starting the war of Polish succession, he was defeated at the battle of Byczyna by the supporters of Sigismund, under the command of Polish hetman Jan Zamojski. Maximilian was taken captive and released only after intervention by Pope Sixtus V. In 1589, he waived his right to the Polish crown. In 1592, he married the Austrian archduchess Anna of Austria (1573-1598) Anna Habsburzanka and after his father's death the same year, he received permission from the Sejm to accept the Swedish throne. After Sigismund promised to uphold Swedish Lutheranism he was crowned king of Sweden in 1594; for a short time there was a personal union between Commonwealth and Sweden (Polish-Swedish union). He tried to rule Sweden from Poland, leaving Sweden under control of a regent, his paternal uncle Duke Charles. In 1596, he succeeded in creating the Union of Brest, which attempted to bring part of the Orthodox religion into Catholicism. In the same year he transferred the capital of Poland from Kraków to Warsaw. After his wife Anna died in 1598, he married her sister Constance of Austria in 1605. Troubles were growing on the southern border of the Commonwealth, where Jan Zamoyski and other magnates were engaged in the Magnate wars in Moldavia. Eventually after the defeat of Polish forces in the battle of Cecora in 1620, Commonwealth would have to relinquish its claims to the Principality of Moldavia. Due to Sigismund's strong support of the Counter Reformation, his support in largely Protestant Sweden eroded quickly. Charles soon took full control of Sweden and rebelled against Sigismund, ostensibly due to fears that Sigismund might re-Catholicize Sweden. In 1598 Sigismund tried to defeat him with a mixed army from Sweden and Poland but was defeated at the Battle of Stångebro. Sigismund was forbidden to rule Sweden from abroad but nevertheless returned to Poland, and so in 1599 was deposed. This and his decision to incorporate Livonia into the Commonwealth led to the Polish-Swedish War, which lasted, with minor breaks, to 1629. Little was gained in this war by either side. The kingship was ultimately ceded to Charles. Sigismund, however, did not relinquish his claim to the Swedish throne, and his subsequent foreign policy was aimed at regaining the Swedish crown. This led to bitter relations and several wars between the two countries, to end only after the Great Northern War. In 1605, Sigismund attempted to strengthen the monarch's power by asking the Sejm (the Polish-Lithuanian Commonwealth's parliament) to limit the liberum veto, increase taxes, and augment the military. His opponents, led by Mikołaj Zebrzydowski, declared a confederation and rokosz at Sandomierz, leading to a civil war known as rokosz Zebrzydowskiego. Eventually, royalist forces defeated the rokoszans on July 6, 1607, at the Battle of Guzów, but the eventual compromise was a return to the status quo ante from before 1605. Another important conflict in his reign was the Polish-Muscovite War (1605-1618), also known as The Dymitriads. Sigismund and many Polish magnates attempted to exploit the Muscovite civil war (the Time of Troubles), and after a lengthy war the 1618 Truce of Deulino gave some territorial concessions to the Commonwealth (mainly the Smoleńsk Voivodship). Nonetheless, this war increased tensions between Poland and Russia, and ruined the prospects for a Polish-Lithuanian-Muscovy Commonwealth. Sigismund was a talented painter and goldsmith: Of his three paintings that survive until the present day one was for centuries erroneously attributed to Tintoretto; from his workshop came the main part of the famous silver coffin of St. Adalbert of Prague at the Cathedral in Gniezno. Sigismund died at the age of 65 in the Royal Castle in Warsaw. Many historians believe that Sigismund viewed Poland only as a tool that would allow him to eventually regain the throne of Sweden. To this end he tried to strengthen his royal power and allied himself with Habsburgs and Counter-Reformation forces. Those politics were opposed by many from Polish nobility (the szlachta), most notably the chancellor Jan Zamojski. 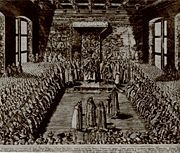 This led to a semi-legal rebellion against the king (rokosz), known as rokosz of Zebrzydowski (1606–1608), which was a response to Sigismund attempt to introduce majority voting in place of unanimity in the Sejm. Eventually Sigismund's loyalist forces were victorious, but the rebels went unpunished. Partially in order to pacify the restless szlachta, Sigismund supported war with Muscovy (the Dimitriads, 1608–1618). Although Commonwealth forces were almost constantly shuffled between wars in the East (with Muscovy), north (with Sweden) and South (with Ottomans - the Polish-Ottoman wars), Sigismund took advantage of Russia civil war (the Time of Troubles and secured temporary territorial gains for the Commonwealth. While Sigismund never managed to regain the Swedish throne, his politics of personal ambition did succeed in provoking a long series of conflicts between the Commonwealth and Sweden and Muscovy. While the Commonwealth Sejm managed to thwart many ambitious (and dangerous) offensive plans of Sigismund (and later of his son, Wladislaw), the Vasa dynasty nonetheless succeeded in partially drawing the Commonwealth into the Thirty Years' War. This senseless conflict with Sweden, combined with wars against Ottomans and Muscovy, eventually culminated well after Sigismund's death in the series of events known as The Deluge, which ended the Golden Age of the Commonwealth. During his reign he allowed the Brandenburg Hohenzollerns to inherit Ducal Prussia. False Dmitry I takes an oath of allegiance to Sigismund III, by Nikolai Nevrev (1874). Assassination attempt on King Sigismund III Vasa by Michał Piekarski in 1620. Sigismund III on catafalque displayed in the Guard Chamber at the Royal Castle. Sigismund III Vasa is pictured in a famous painting by Jan Matejko, depicting the preaching of Piotr Skarga. Equestrian Portrait of Sigismund III. Tomasz Dolabella's workshop. Royal Castle in Warsaw. The King began an extensive reconstruction of the castle in 1598. St. Casimir's Chapel in Vilnius Cathedral founded by the King in 1623 (the architect was Constantino Tencalla). St. Peter and St. Paul's Church in Kraków, established by Sigismund III in about 1595. Virgin and Child by Palma il Giovane created in 1618 for the King. The Church of Our Lady of Grace in Warsaw founded by the King in 1609. Ujazdów Castle in Warsaw, built for the King by Giovanni Trevano in 1624. Coat of Arms of king Sigismund on a cannon he financed. Sigismund III Vasa is mainly remembered for his part in initiating and perpetuating a series of wars that coincided with his own futile struggle for full control of a Polish-Swedish Commonwealth. During his lifetime, he would have a hand in drawing his subjects into the harrowing Thirty Years' War and effectively leading Poland to the end of its Golden Age of Commonwealth. His political legacy is marked by the friction and discord amongst his own people, as well as with outside forces. Sigismund III Vasa is surely to be noted for his militaristic affairs above all else that occurred during his perpetual grasp for power. In addition, he was also talented in the arts, though for this he is far less well-known. ↑ Muzeum Zamku i Szpitala Wojskowega na Ujazdowie, Zamek Ujazdowski. Retrieved October 24, 2008. Lukowski, Jerzy, and Hubert Zawadzki. 2001. A Concise History of Poland. Cambridge: Cambridge University Press. ISBN 0521559170. Kieniewicz, Stefan. 1984. Warszawa w latach 1526-1795. Warsaw, PL: Państwowe Wydawn. Naukowe. ISBN 8301033231. Muzeum Zamku i Szpitala Wojskowega na Ujazdowie. Zamek Ujazdowski. Retrieved October 24, 2008. Oakley, Stewart P. 1992. War and Peace in the Baltic, 1560-1790. London: Routledge. ISBN 0415024722. Orvis, Julia Swift. 1916. A Brief History of Poland. History of "Sigismund III Vasa"
This page was last modified on 1 December 2008, at 23:05.